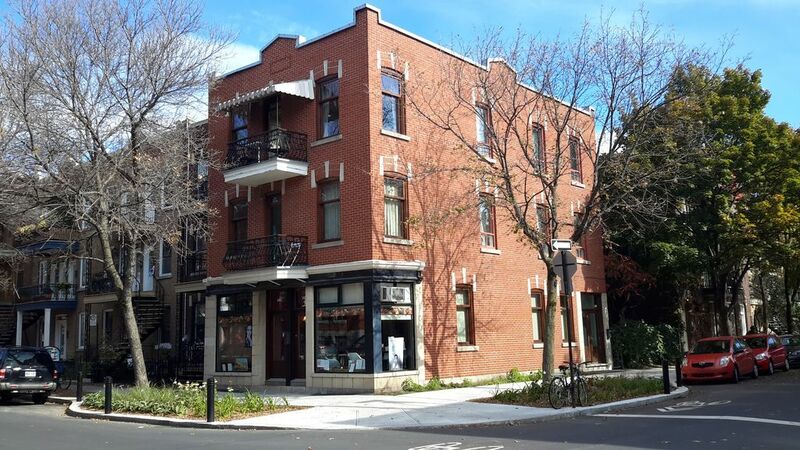 (Text automatically translated) The apartment is located on the Plateau Mont-Royal at the corner of Laurier and Garnier, 10 minutes walk from the station METRO BAY. The Laurier is a semi-commercial street where we find a very hardy species of commerce. It is relatively easy to park a vehicle on the street Garnier or the surrounding streets.The air-conditioned apartment has three private bedrooms, a lounge, a walk-in closet, two balconies. The kitchen is equipped with fridge, dishwasher, convection oven, microwave oven, steam oven, induction hob, a retractable hood, warming drawer food and a warming drawer. Property matched completely the description. Location is just excellent and surrounded by local coffee shops, ice ream shops, small restaurants , heath food store and very well stocked supermarket. Metro is only 10 mins walk and the owner provides metro cards that you can load up so access to the city centre is easy. There is also an Avis car hire only a few minutes walk away that we used a few times to get to activities outside the city (recommend you pop in a few days before to books as its small office with limited stock). Car parking overnight is a bit of a problem but Avis allowed us to use their lot at the back of there office so worth asking them. Owner lives just upstairs in the flat above so always on hand if there are any problems or advise required. Remember to take the cash deposit with you (we overlooked this but wasn't a problem and we got to the ATM the next day). Strongly recommend this property. We were a family of 4 with kids ages 12 and 15. The best HomeAway apartment we've stayed in! We had a very warm welcome from Andre when we arrived. The apartment was in a good location, spacious and very well equipped, in fact the kitchen was like mission control! but once Andre showed us how to work things we were fine, especially the coffee machine, I was in seventh heaven with cappuccinos every morning! Carol showed us how to work the tv channels so we could catch up with the news or watch a film if we felt like it. The amenities were a short walk away, supermarket, wine shop, coffee shop and restaurants. One restaurant where you could bring your own wine (not the thai) was a bit longer to walk, but well worth it. We also enjoyed people watching from our balcony while sipping a drink. The metro was about 15 mins away, but very quickly got you to downtown Montreal or wherever you wanted to go. We really enjoyed our stay in Montreal and would recommend this apartment to our friends if they were going to Montreal. Thanks again Carol and Andre for being such good hosts! "We had a fantastic stay in Montreal and Carol (our host) was wonderful. The apartment was great: very comfortable and super well situated... not so close to the Metro but there's a Bixi station right out front. Our hosts have a wonderful sense of detail: Opus (transit) passes were waiting for us as well as a calling card, two details that allowed us to arrive and establish our lives in the city quickly." "Everything was perfect. Our hosts made us feel at home from the minute we arrived and nothing was too much trouble. The area is ideal for exploring the city with all amenities close by.It was a lovely place, a great city and a brilliant apartment. A very memorable holiday. Thanks to our hosts once again for everything they did for us, it was most appreciated!" "I go to Montreal every year in July for the Jazz festival, and the apartment is the best that I have stayed in. The apartment is private, bright, clean, and spacious, with three very nice bedrooms, a balcony on the front where you can people-watch in the lively street below, and another balcony (with iron staircase) at the back of the apartment where you can be alone and quiet in a garden atmosphere. The kitchen is modern, clean, and fully-stocked. Right across the street you can buy excellent coffee, croissants, and bread. There is a full supermarket also just down the street, and it is a short walk to the metro, and to the rest of the Plateau. It is a perfect location in Montreal because you are in a lively, interesting neighborhood, yet the rest of the city is extremely easy to get to by foot or metro. If you need anything, the owners are there to assist you. But you will feel during your stay that you are living in your own apartment in Montreal, and you will be very happy there. You will experience what Montreal really feels like." "This apartment is wonderful. It is a perfect home-away-from-home for families. It is equipped with a high chair, portable crib/play pen, kid's movies and even toys. There is also a lovely park with children's playground a short walk away (near the metro station). The neighborhood is beautiful and is a superb place for food lovers. There are many excellent bakeries and food shops offering high quality products, as well as several good restaurants. Your hosts, André Bernard and Carole, are incredibly kind and thoughtful and go out of their way to make you feel welcome and cared for." TARIF: du 15 janvier au 01 juillet et 15 septembre au 15 décembre: 910$ CAD semaine / 130$ CAD par jour supplémentaire / 2800$ CAD par mois. TARIF du 01 juillet au 15 septembre et 15 décembre au 15 janvier: 980$ semaine / 140$ CAD par jour supplémentaire / 3000$ CAD par mois. Payable en $ CAD seulement. Veuillez prendre note que la taxe d'hébergement (3.5%) ainsi que les taxes fédérale et provinciale (5 & 9.975%) doivent être appliquées lors d'un séjour de moins d'un mois.